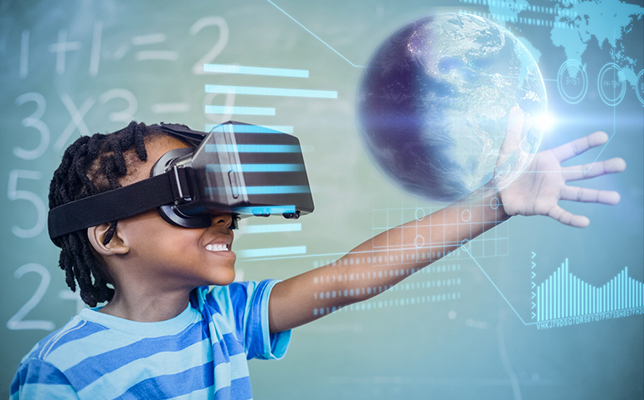 Virtual reality (VR) has found its way into the educational space, and by all indications, it’s here to stay. Since VR glasses can be obtained for as low as $10 apiece, cost is becoming less of an issue, although the expensive headsets are still out of reach for many. Nonetheless, the actual applications beyond the “wow, cool” factor are still being explored. 1. Choice of content should be developed in a virtual reality environment. The first experiences of VR as applied to e-learning processes have revolved around the development of very specific skills and knowledge, according to E-Learning Industry, such as work safety and specific simulators in the field of vocational training. In the educational context, there are a number of examples of the application of VR to recreation and immersion in very concrete environments, such as natural settings, planets, animals, human anatomy, etc. In the last two years, we can find examples of the proliferation of highly immersive learning experiences related to the development of skills: speaking in public, teamwork, conflict mediation, treatments and therapies with patients. In short, virtual reality offers a wide range of possibilities, whether one decides to pursue the development of a competition or a skill. 2. Correctly guiding the instructional design of the VR experience. The adoption of 360-degree video in VR applications — and in particular in the development of e-learning content — is leading toward more widespread VR use, as costs drop and the versatility and realism improve. Being able to capture any environment, moment or interaction with a simple 360-degree video camera, or even with a smartphone, facilitates the development of immersive experiences that are interesting and engaging for students. E-Learning Industry says it is important to craft a detailed instructional design, with the maximum presence of audiovisual pieces, such as videos or animations, that replace text, since text reduces the immersive power and the interaction with virtual spaces. Sorry, bookworms. 3. Correctly choose the platform of distribution of VR content. According to the E-Learning Industry article, virtual reality glasses or headsets that connect to a computer are the more powerful option. However, a budget based on this type of project will inevitably run high, as this type of VR hardware is more expensive than the option of using VR glasses designed for use with a smartphone. The latter requires the development of mobile applications compatible with Android devices, iOS and/or Windows mobile. The economic impact for these types of projects will tend to cost less. A choice of using VR in e-learning should be based on all these parameters, the article states. An educator should negotiate an optimal balance between high immersion, mobility and investment capacity. For more information on VR and e-learning, visit the E-Learning Industry website, or read this article in THE Journal.